The Phillies Nation Top 100 continues today with #49. Our mission is to assess the Top 100 Phillies players of all time using impact to the Phillies, individual achievement, team achievement, traditional stats, and analytics as our criteria. The list was compiled by Ian Riccaboni and Pat Gallen with input from the rest of the Phillies Nation staff. From this point forward, each weekday, we will reveal two Phillies from the PN Top 100 in separate posts. To view the 2008 iteration of the list of Greatest Phillies of All Time as compiled by Tim Malcolm, please click here. To view this year’s Top 100 Phillies list, click here. Please check back tomorrow morning for #48. 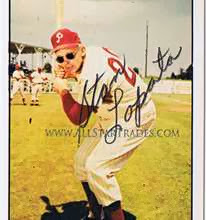 “Stash” was one of the most unlikely stars in Phillies history. Tabbed the starting catcher over veteran Andy Seminick prior to the start of the season in 1949, Lopata ended up starting less games than Seminick but put up a solid .271/.330/.425 line with 8 HR in 261 PA as a 24-year old rookie. Lopata would remain the back-up catcher for the 1950 Whiz Kids and reached the World Series. By 1951, Lopata was fighting injuries and was being shuttled back and forth between Philadelphia and the Triple-A Baltimore Orioles. Lopata would return to the Phillies full-time in 1952, becoming one of the league’s most productive back-ups, hitting 14 homers with a .290/.369/.544 line in 298 PA. It was during the 1954 campaign that Lopata adapted a batting stance so low that Jeff Bagwell would be envious. In 1955, Lopata would split time with the returning Seminick and a June hot streak (.339/.382/.613, 5 HR) would push Lopata on to the All-Star team. Lopata would return to the All-Star team in his only year with the Phillies where he accumulated over 450 plate appearances, hitting 32 HR. Despite his limited playing time, Lopata ranked fifth in homers among catchers, had the sixth best walk-rate among catchers, ninth in OBP, and fourth in slugging among catchers between 1948 and 1958. Despite rarely being a starter, Lopata, and his signature glasses, was one of the very best catchers the Phillies had and was one of the best catchers in baseball for eleven seasons.